59. 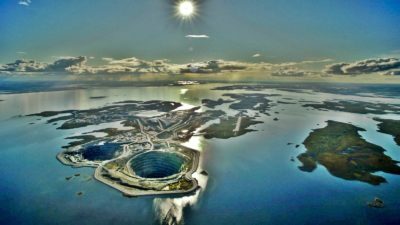 Hydrogeology At Diavik – Its Complicated - KJ Kuchling Consulting Ltd.
About 20 years ago I was involved in the feasibility study and initial engineering for the Diavik open pit mine in the Northwest Territories. As you can see from the current photo, groundwater inflows were going to be a potential issue. Predictions of mine inflow quantity and quality were required as part of the project design. Also integral to the operating plan were geotechnical issues, wall freezing issues, and methods for handling the seepage water. This mine is going to be a unique situation. The open pit is located both within Lac de Gras and partly on exposed land (i.e. islands). The exposed land is underlain by permafrost of various depth while the rock mass under the lake was unfrozen. The sub-zero climate meant that pit wall seepage would turn into mega-icicles. Phreatic pressures could buildup behind frozen pit walls. Many different factors were going to come into play in this mining operation so comprehensive field investigations would be required. At no time did the engineering team feel that field budgets were restricted and that technical investigations were going to be limited. Unfortunately in my subsequent career working on other projects I have seen cases where lack of funds does impact the quantity (and quality) of technical data. The Golder Associates Vancouver hydrogeologcal team was brought on board to help out. Hydrogeological field investigations consisted of packer testing, borehole flowmeter testing, borehole temperature logging, and borehole camera imaging. Most of this work was done from ice level during the winter. A Calgary based consultant undertook permafrost prediction modelling, which I didn’t even know was a thing. All of this information was used in developing a three-dimensional groundwater model. MODFLOW and MT3DMS were used to predict groundwater inflow volumes and water quality. The modelling results indicated that open pit inflows were expected to range up to 9,600 m3/day with TDS concentrations gradually increasing in time to maximum levels of about 440 mg/ℓ. The groundwater modelling also showed that lake water re-circulating through the rock mass would eventually comprise more than 80% of the mine water handled. Groundwater modelling of a fractured rock mass is different than modelling a homogeneous aquifer. Discrete structures will have a great impact on seepage rates yet they can be difficult to detect beforehand. As an example, when Diavik excavated the original bulk sample decline under the lake, water inflows were encountered associated with open joints. However a single open joint was by far the most significant water bearing structure intercepted over the 600-metre decline length. It resulted in temporary flooding of the decline. Interestingly at least two technical papers have been written on Diavik by the project hydrogeologists. They describe the original inflow predictions in one paper and the actual situation in the second. The 2000 paper describes the field investigations, the 1999 modeling assumptions, and results. You can download that paper here. 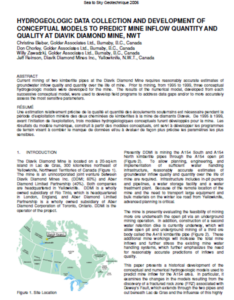 The subsequent paper (2006) describes the situation after a few years of mining, describing what was accurate, what was incorrect, and why. This paper can be downloaded here. In essence, the volume of groundwater inflow was underestimated in the original model. The hydraulic conductivity of the majority of the rock mass was found to be similar. However a 30 m wide broken zone, representing less than 10% of the pit wall, resulted in nearly twice as much inflow as was predicted. The broken zone did not have a uniform permeability but consisted of sparely spaced vertical fractures. This characteristic made it difficult to detect the zone using only core logging and packer tests in individual boreholes. The original intent was the Diavik groundwater model would not be static. It continued to evolve over the life of the mine. Now that Diavik has entered their underground mining stage, it would be interesting to see more updates on their hydrogeologcal performance. If anyone is aware of any subsequent papers on the project, please share. Posted in: Mine Modelling, Mine Studies, Operations. I visited the mine in 2004 as part of a contractor team preparing to bid on the decline. I remember standing in the pit, watching water inflow along the walls. If memory serves, the water was also saline, which complicates dewatering due to significant maintenance efforts to keep pumps and pipelines going. As far as I know the water was not saline. The groundwater at depth (1000 metres) had higher TDS and over time that would migrate upwards and mix with the lake seepage. I also understand that the now shutdown DeBeers Snap Lake underground operation was mining under a lake and had a lot of groundwater issues (insurmountable eventually), possibly higher TDS water there.